Mastitis in dairy cattle is the persistent, inflammatory reaction of the udder tissue. This potentially fatal mammary gland infection is the most common disease in dairy cattle in the United States and also the most costly to the dairy industry. Mastitis is most often transmitted by contact with the milking machine and through contaminated hands or materials. A good milking routine is vital to prevent mastitis. Prevention methods usually consist of applying a pre-milking teat dip or spray, such as an iodine spray, and wiping teats dry prior to milking. The milking machine is then applied. After milking, the teats can be cleaned again to remove the growth medium for bacteria. A post milking product, such as iodine-propylene glycol dip is used, to act as a disinfectant and a barrier between the open teat and the bacteria in the air. This disease costs the U.S. dairy industry about $1.7 billion to $2 billion each year. To prevent mastitis and ensure a clean and efficient milking process each time, GEA Farm Technologies has recently launched the ApolloMilkSystem within the marketplace. This device is an automated dipping process and automated back flush system all in one unit. The ApolloMilkSystem dips versus spraying to ensure the udder is completely submerged in a pool of liquid to provide complete coverage. Our own Series 300 Check Valves provide accurate flow control of the dip distribution to all four lines of the cluster. The one-way design does not allow the vacuum to transmit between liner heads during the milking process. After milking, the cluster is removed and back flushed, removing any residual dip and sanitizing the unit in anticipation for milking the next cow. Over 95% of the organisms that could infect the herd are eliminated, decreasing the chance of contagious mastitis. 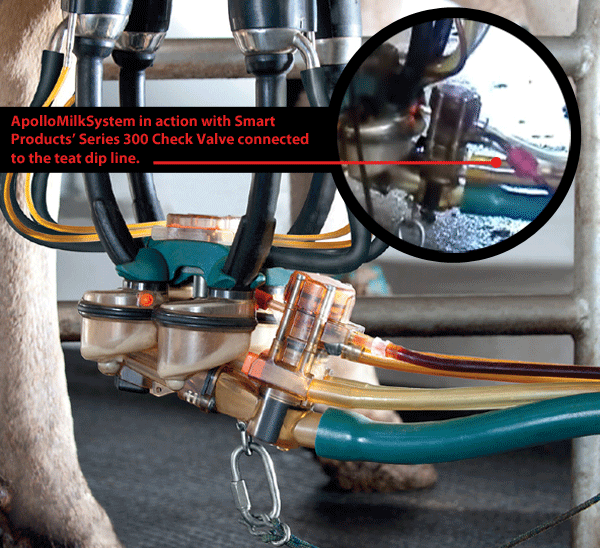 A key component of this device is the safety valve attached to the milking unit. This valve effectively separates the milk from the dipping operation for a contamination-free operation - a critical component for FDA compliancy.